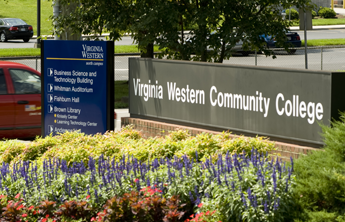 Virginia Western Community College (WVCC) is a two-year public institution of higher education operating under the Virginia Community College System, a statewide system of community colleges. The College operates under the policies established by the State Board for Community Colleges and the Virginia Western Community College Local Advisory Board. Virginia Western is located on a 70-acre campus in southwest Roanoke, VA. The campus currently sports a state-of-the-art center for Science and Health Professions and a brand new Student Center. Work is soon to begin on a brand new STEM (Science, Technology, Engineering, and Math) facility! The service region of the College includes Roanoke, Salem, Roanoke County, Craig County, southern Botetourt County, and northern Franklin County. The College was established in 1966 and has grown from an initial enrollment of 1,352 to its current enrollment of over 12,000. Virginia Western's Workforce Solutions designs timely, customized training programs to address the ever-changing opportunities and challenges faced by employers. The college will design and implement custom training programs to update and improve workforce skills, increase employee engagement, improve company performance and help achieve organizational goals. The training can occur at the work site or on Virginia Western's campus.